On the top of the Ailly cliffs, surrounded by gardens and woods, Varengeville church dominates the sea. Originally built in the 12th century, then enlarged in the 16th century, the building has resisted storms and the assault of the waves that gnaw at the cliffs below. Despite the church having been built “by saintly hands” as an archaeologist has written and inhabited by monks, nothing will be strong enough to defeat the sea which even today is ready to engulf the building. The village council, the state and the county and regional councils have recently undertaken a programme of consolidation and protection to save the church. The southern nave, probably built by Jehan Ango to enlarge the original church, is in sandstone and dates from 1548. Note the remarkable column decorated with curious motifs inspired by the voyages of Jehan Ango’s captains and the column with a spiral of ropes and scallop shells. In the main nave there is a wooden polychrome statue of St Valery the church patron, by the Dieppe sculptor Michel Borlé and another statue of a holy woman. The font, decorated with cherubs’ heads and acanthus leaves, dates from 1613. There is tombstone dated 1634 on the north wall beside a 17th century memorial stone to Jean Guilbert. The central square of the transept has fine columns and 16th century arches and carved keystone. The wooden statue of Christ dates from the 18th century but the altar in Oise stone is recent (made by the Lanfry firm) and replaces a carved altar consecrated in 1928 which was the work of Josephine Vasconcelos. If you proceed to the left, you will see the beautiful 16th century keystone and vaults. The entrance to the sacristy dates from 1643 as is shown on the arch. 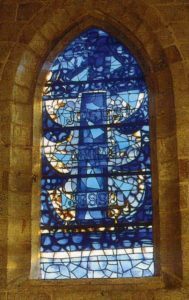 The chancel is bathed in the blue light diffused by the abstract stained glass window designed by Raoul Ubac, a friend of Georges Braque. 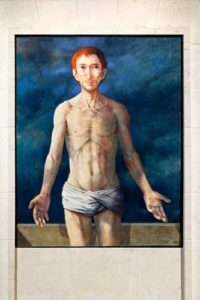 In 1998, Michel Ciry gave the church a huge oil painting of Christ the Redeemer and in 2009 he offered the two paintings which flank it. – the statue of Our Lady of the Waves at the ship’s bows, clothes blowing in the wind, watching over the souls of the fishermen. This chapel is made iridescent by the peaceful blue colours of the Tree of Jesse stained glass window, the work of Georges Braque who died in 1963 and is buried in the churchyard. The north wall of the church dates from the 11th century. Opposite the entrance on the southern side, the Hosanna Cross was erected in the 16th century. The porch was also built in the 16th century. The church is composed of two parallel naves ending in three chapels with flat rear walls. Above the transept is a bell tower dating from the 13th century (alternate layers of brick and stone with Ailly sandstone cornerstones). This tower has been struck by lightning several times, for example on December 3rd 1826, the steeple collapsed during Vespers. The church is covered with a slate roof. – two 16th century windows. The side door is under a surbased arch with a rope carving and dated 1548. The flat buttresses of the southern transept are part of the original church. The sacristy, built of brick and flint, was added in the 19th century to the north-east chapel built of sandstone extracted from the Ailly headland.